Microsoft offers efficient Windows NTBackup Utility, in order to let user to create backup of valuable system files & folders like - drives, music, images, system state data, documents, registry and etc. 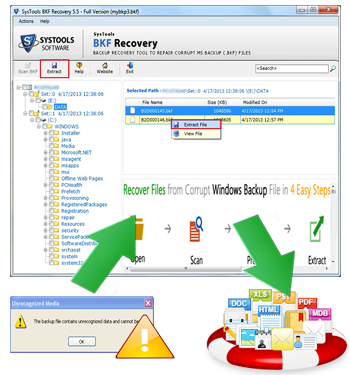 SysTools BKF Repair is an effectual & powerful MS BKF Repair application to repair corrupt BKF files that created by using NTBackup.exe or MS Backup Utility. Software allows users to recover inaccessible BKF data which contain audio, images, video, email, documents files. The software interface is quite user-friendly. With step by step assist wizard, even a novice can use the software self-confidently. Software allows users to extract files from BKF data to desired location or original location. Software supports recovery from unlimited size of BKF file. View content of file before extracting/saving file from BKF data, so as to ensure integrity of files. It helps you to extract/save only a small portion data from any large sized BKF file.